Proteins in lipid membranes are one of the fundamental building blocks of biological functionality. Lawrence Livermore researchers have figured out how to mimic their role using carbon nanotube porins. 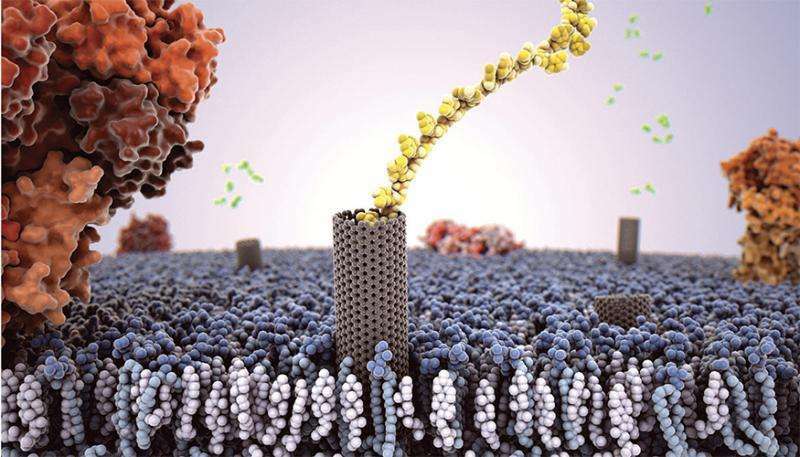 Using high-speed, atomic force microscopy (HS-AFM), the team showed that a new type of biomimetic channel—carbon nanotube porins (CNTPs)—also is laterally mobile in supported lipid membranes, mirroring biological protein behavior. The research opens the door to use CNTPs as models to study membrane protein physics, as well as versatile and mobile components for artificial cells and hybrid systems that combine biological cells and man-made components. Lipid membranes represent one the fundamental components of the architecture of life because they provide a versatile matrix for a variety of membrane proteins that can perform a variety of tasks including molecular recognition and signal transduction, metabolite transport and membrane remodeling. The 2-D fluid nature of the lipid membrane not only allows it to adapt to a variety of shapes, but also permits membrane proteins to diffuse within this 2-D plane, enabling many important biological processes. "To understand the fundamental physics of protein motion in the lipid membrane, we needed an approach that would combine simple and robust membrane protein models with imaging and tracking approaches that can follow membrane motion on the relevant length and time scales," said Yuliang Zhang, an LLNL postdoctoral researcher and lead author of a paper in the journal, Philosophical Transactions of the Royal Society B . The team created simple and versatile artificial membrane pore equivalents—CNTPs —that are made of short segments of single-wall carbon nanotubes that can self-insert into the lipid membrane and form a transmembrane pore. These very simple objects show a wealth of behaviors similar to membrane protein pores: they can transport water, ions and protons across the membrane. "We found that the CNTPS were able to reproduce another key property of membrane proteins—their ability to diffuse in the lipid membrane," said Alex Noy, LLNL scientist and the principal investigator on the CNTP project. "High-speed AFM imaging can capture real-time dynamics of CNTP motion in the supported lipid bi-layer membrane." Zhang said the study demonstrates that the similarities between CNTPs and biological membrane pores include not only similar transport properties, but also the ability to move laterally in the membrane. Other LLNL researchers include Ramya Tunuguntla and Pyung-On Choi. The research appears in the June 20 edition of Philosophical Transactions of the Royal Society B . While punching a hole in the membrane using a tube is interesting, I am curious how close the researchers are to generating to the two most important functions of such pores. The first of course is ATP mediated active transport in which ions and such are moved against a gradient, and being able to control (i.e. shut off) flow based on adhesion of some kind of regulator. "Inhaling carbon nanotubes could be as harmful as breathing in asbestos, and its use should be regulated lest it lead to the same cancer and breathing problems that prompted a ban on the use of asbestos as insulation in buildings, according a new study posted online today by Nature Nanotechnology." - Scientific American, May 20, 2008.